This paper describes how the Fokker-Planck equation and the simulation of stochastic trajectories can be used to explain capital accumulation and deforestation process. 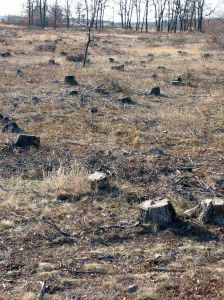 Conventional wisdom says that farmers clear a forest because of their poverty. This paper shows a case in Indonesia where deforestation depends on the capital accumulation behavior of richer farmers and holders of capital. This paper shows how the world’s appetite for spices has led to extensive deforestation in a national park. Field study was undertaken in the Kerinci-Seblat National Park, the Province of Jambi, Indonesia in mid-1990s, where massive encroachment into the park was caused by land-clearing for cinnamon planting.